To test these new breed of mesh networking systems, we are changing our test environment, but our test setup remains relatively unchanged. We have two notebooks, one acting as a host machine and the other as a client device. The router, or in this case, node, acts as a gateway. Since mesh networking systems typically manage channel settings on their own, we will leave it that way. For systems where manual settings are possible, a channel bandwidth of 40MHz is selected where applicable, while 80MHz or more is used for the 5GHz AC band. The client device is a 2015 13-inch MacBook Pro, which is one of the few client devices in the market to come with a 3x3 Wi-Fi receiver, allowing it to achieve wireless speeds of up to 1,300Mbps. To evaluate, we will be measuring the time and calculating the speed achieved when transferring a 1GB zip file. 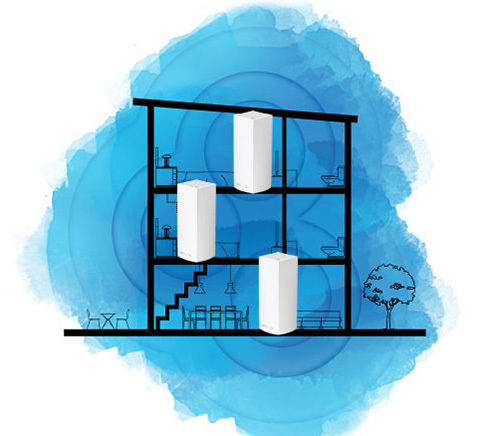 We will do multiple tests with different setups and different distances to simulate use around a typical single story flat and in a multistory home. And to clarify, in tests where nodes were placed on the second or third floor, the measurement would be taken with the client device about two meters away. 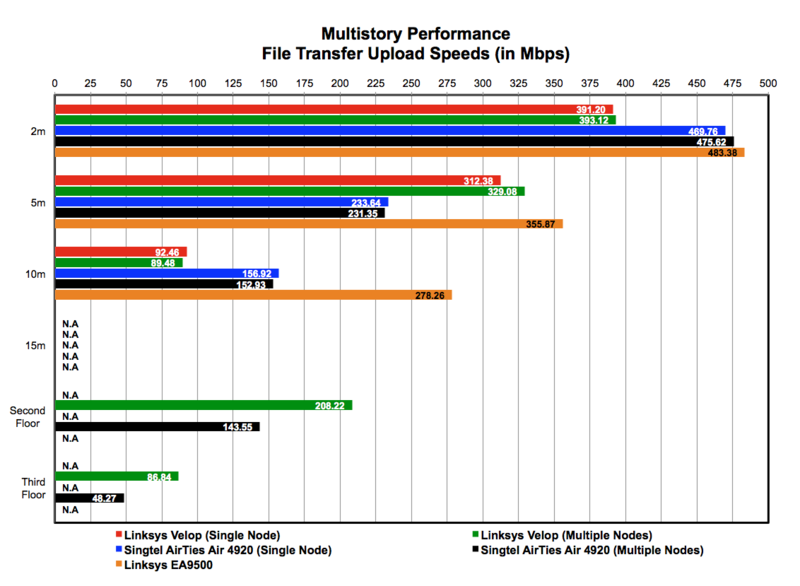 Looking at the uplink and downlink numbers below, it is immediately apparent that a single Velop node doesn't offer quite as much performance or range as Singtel’s AirTies Air 4920 mesh networking system or the high-end Linksys EA9500 router. However, that is to be expected of the Velop’s 2x2 radio configuration, which means its maximum attainable transfer rates over the 5GHz network is 867Mbps, compared to the 1300Mbps of the AirTies Air 4920 and the 2,167Mbps of the Linksys EA9500. However, what is more noteworthy is how its performance dipped drastically as we approach 10 meters. 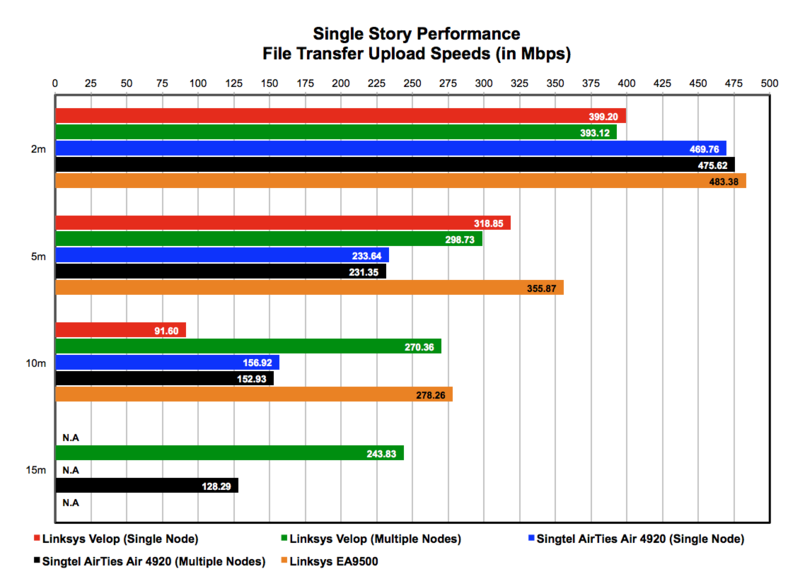 At 10 meters, the Velop's uplink and downlink speeds were significantly lower than the AirTies Air 4920 and Linksys EA9500. Also, note that none of the single router setups could transmit reliably at 15 meters. Since our Velop was a 3-pack bundle, we decided to spread coverage by placing one node at the midway point between the first node and our 10-meter test mark. And since the 15-meter mark was a dead zone, we placed the third node at the midway point between the 15-meter mark and the first node. We did the same for the AirTies Air 4920 as well for the 15 meter. The results were quite surprising. With multiple nodes spread over a single floor, performance improved dramatically throughout the farther ranges of 10 and 15 meters. With the second node in between the 10-meter mark and the first node, downlink and uplink performance increased by over 300% overall. And at the 15 meters mark where there was previously no coverage, we could achieve speeds of over 240Mbps in both directions, which is impressive. Clearly, the Velop works well in expanding Wi-Fi coverage. 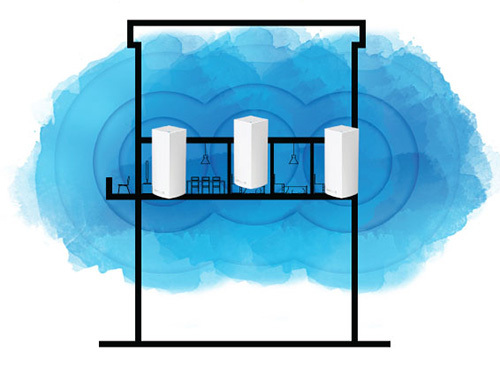 In this setup, we will be looking at the performance of the Velop across a multistory setup. Most crucially, we will be investigating how the performance of a single Velop node compares with that of a multiple Velop node setup that has nodes on each floor. Here, we will also compare it with a single AirTies Air 4920 setup and a multiple AirTies Air 4920 setup (again one node on each floor), and finally against a single Linksys EA9500 router. With a single Velop node, we got the same results attained earlier in our single floor test. We also discovered that a single Velop node cannot reliably broadcast its 5GHz network to the floor above. This was the same for the single AirTies Air 4920 setup. Only the Linksys EA9500 could reach the second floor, but that was only for the downlink test. We could not upload files reliably through the Linksys EA9500 from the second floor. Additionally, since now we only have a single node on each floor, the 15-meter mark was a dead zone for all setups. Clearly, at extreme ranges you need more than a single router or node on each floor. With multiple nodes setup on each floor, we could transfer files quite briskly from the second floor and even when we were on the third floor. We managed speeds of over 80Mbps from the third floor, which is quite comfortable for web browsing. Here, we can also confirm that the mesh networking performance of the Velop is more impressive than that of the AirTies Air 4920. 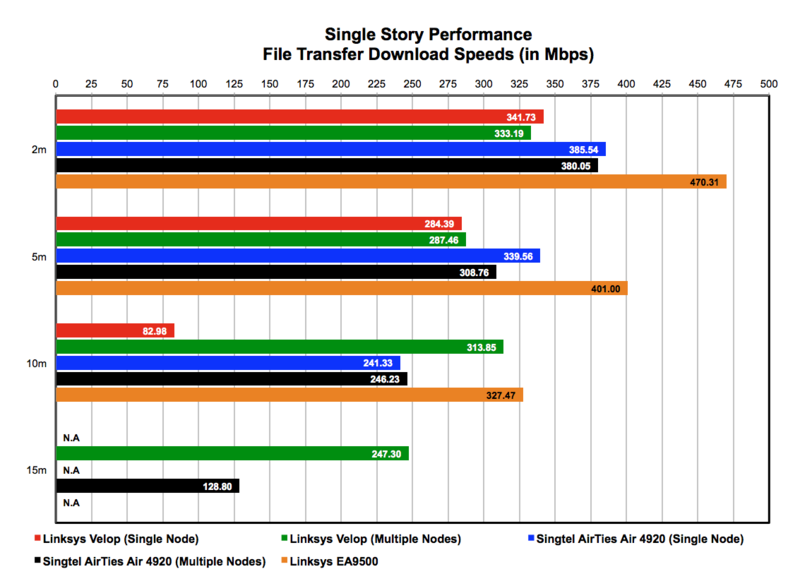 As our tests show, if you have Wi-Fi problems, the Linksys Velop can help. 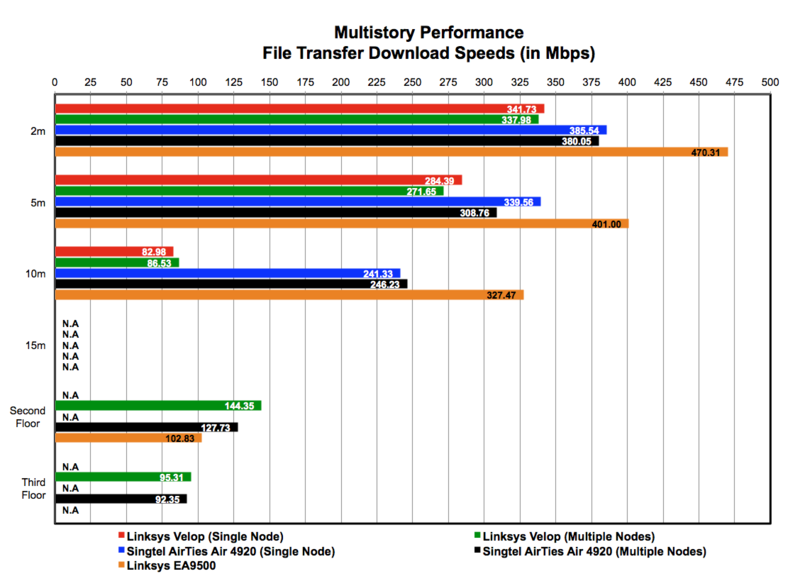 The range of each individual Velop node is not that fantastic, especially when compared to Linksys' own flagship EA9500 router. But it really is a case of two is better than one here. With multiple Velop nodes, we can increase our Wi-Fi coverage to areas that even the flagship EA9500 router cannot reach. Plus, as we established earlier in our introduction to mesh networking article, mesh networking systems are generally many times faster than traditional range extenders. For casual users who only want to expand their Wi-Fi coverage and get rid of Wi-Fi dead spots in their home and don't care much about anything else, the Linksys Velop is a great piece of investment. It is easy to setup, has most of the basic functions that will satisfy casual users, and perhaps most importantly, it just works. However, for more savvy users, there are some things to consider. First and foremost is the shortage of ports - Each Velop node comes with just two Ethernet ports and no USB ports. And this could be problematic for users who have multiple devices that they might want to connect directly to their router via Ethernet. In addition, the lack of USB ports means no print and file sharing too. Another thing to consider is performance. Overall, the Velop does a good job of extending coverage, but for users concerned with performance, a single Velop is considerably less quick and provides less range than a single high-end router - even though they cost about the same. And as we mentioned, the range of a single Velop is quite limited. So for readers with large homes, you would need quite a number of Velop nodes to ensure comprehensive Wi-Fi coverage and even more to maintain high performance. This brings us to cost. A single Velop costs S$349, which can get you a pretty decent high-end router. A double Velop bundle goes up to S$599 and a triple pack is S$749. There’s no other way to put this: the Velop is pretty pricey. 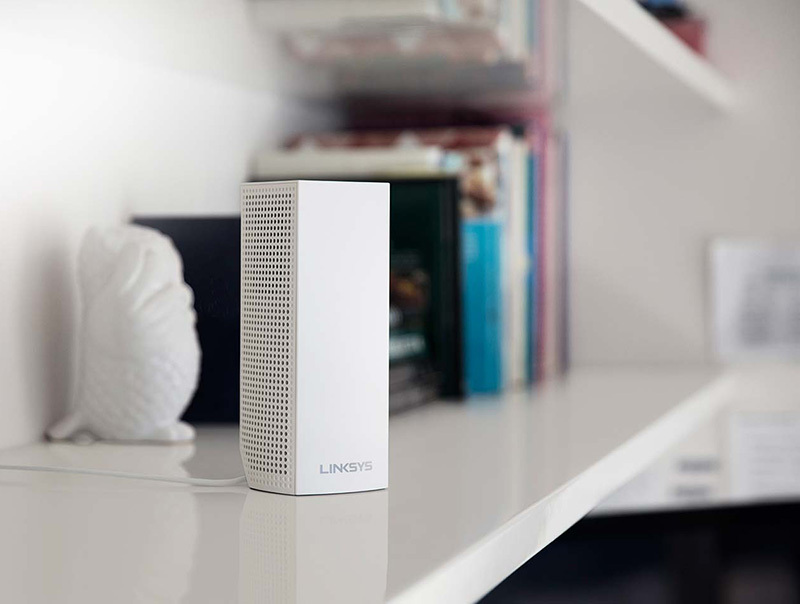 In closing, Linksys has delivered on its promise of "whole home Wi-Fi" with its Velop mesh networking system. But whether you should buy it for your home really depends on your needs, usage scenarios, and requirements. If you are a casual, mainstream user that has Wi-Fi dead spots at home or if all you want is to blanket your home in Wi-Fi, the Velop is perfect - it will get the job done with the least amount of effort. However, if you are a more discerning user that requires more performance and connectivity, then the Velop alone won't cut it and you might want to use it in tandem with a high performance router.